In July 2007 we went on a 3 day bushwalking and Camping trip to Kakadu national park in the Northen territory, Australia. 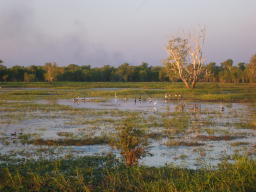 Kakadu is an amazing place and is what you think of when you think of Australia. Most of the park is off bounds to tourists and campers, as it is Aboriginal Land, but what is available is well worth seeing. After leaving Darwin, we started at Corroboree Billabong for some Crocodile spotting and then headed for Maguk waterhole for a swim before collecting some firewood and setting up camp for the night. The next day we went on a bushwalk to Jim Jim falls. It’s a 900m climb up a sheer cliff and then a 4km hike out to the top of the falls. It’s not easy, but the falls are great. The last day we experienced some of the aboriginal culture and went to Anbangbang to view some rock paintings. It is almost unreal to think that some of the paintings are 10’s of thousands of years old and, hopefully, will be there long after our culture is long gone. We were going to head out the Ubir for see some more paintings but we had a bit of “tire trouble” (A flat). It’s was a bit disappointing to miss the paintings, but it’s all part of the trip and makes a good story.